The German Cockroach is primarily a nocturnal pest and favours warm, humid atmospheres, especially where temperatures are around 25° to 30° C, they are generally not found outside and prefer heated buildings were they can swim, fly and climb smooth surfaces easily, enabling them to hide in inaccessible places. The adult is about 12-15mm long, light brown or tan, and has two dark longitudinal stripes on the thorax. The German cockroach reproduces quicker than the other common types found in the UK, the female will carry the Ootheca (egg case) for approx 1 month just until it is about to hatch, when between 35 – 40 nymphs will emerge. The immature nymph is smaller, dark coloured with a light coloured streak running down its back. They will moult 5 – 7 times before reaching maturity in about 40 – 125 days and an adult will live for about 200 days. Many people are repulsed and disgusted by the simple presence of German Cockroaches. 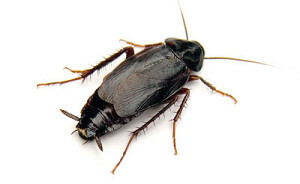 However, they can pose an important public health risk by contaminating food, surfaces and eating utensils.” German Cockroaches are known to carry pathogens, such as Salmonella and E.Coli, which can result in human diseases, such as food poisoning or diarrhoea. 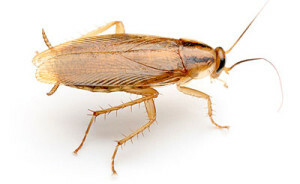 The Oriental cockroach is found mainly indoors in buildings like hospitals, hotels, restaurants, and blocks of flats, and within basements and cellars. It can also be found outdoors around drains, dustbins and rubbish tips. The adult Oriental cockroach is dark brown to black in colour, very shiny, has a flatten body with a length between 25 – 30 mm and has long flexible antennae, they cannot fly, as the female has undeveloped wings or climb smooth surfaces, however they can move very rapidly. The females produce between 5 – 10 Oothecas in their life cycle of up to 500 days. She will deposit her Ootheca which will take two mouths to hatch and house 16 eggs. Each nymph will moult 6 – 10 times within a period of 5 – 9 months before reaching maturity. Cockroaches are nocturnal by nature being visible often only at night. They spend the day hiding in cracks around areas like sinks, drains, cookers and the backs of service ducts. If at night you suddenly turn the lights on you may see them. If they are present in large numbers they may give out an unpleasant almond-like smell.